Uchida Ryogoro (1837-1921) was a menkyo in Shindo Muso ryu who taught Nakayama Hakudo. While in Tokyo he invented sutekki-jutsu as a way to popularize Jodo by introducing jo-like self-defence with a western walking stick - which was a big rage in early 1900 Japan. He went back to Fukuoka and taught the set at Shiriashi Hanjiro's dojo. Shimizu Takaji was one of Shiriashi's students and he later also went to Tokyo and eventually taught jo to over a million students. The weapon itself is, of course, basically Western - the cane, imported during the Meiji era - but all or most of the techniques for handling it are adaptations of moves for other Japanese weapons. Originally the length would depend on the preference of the owner, but generally today a stick of 3 shaku long and 9 bu in diameter is used. The son of Ryogoro, Uchida Ryohei, became head of a committee to formulate a standard set of 12 tanjo techniques that became known as Uchida ryu tanjojutsu. However, Uchida ryu also continues to be practiced in the older form by some teachers in Shindo Muso ryu. There are considerable differences between the Seitei version of tanjojutsu and the original Uchida ryu katas. Mostly the original katas are more martial, the Seitei version simpler and more concerned with esthetics. The first major difference is in the holding of the stick; in Uchida ryu, the stick is carried as a walking stick, and the grip is changed at the moment of the attack. In Seitei the stick is carried in the combat position from the start. Of course timing is more difficult in the Uchida ryu version. It also provides a logical reason for certain pauses in the kata (for changing grip) that are hard to explain in the Seitei version. Another very apparent difference is in the use of the sword: in Seitei tanjojutsu the sword is raised from hasso to jodan before a cut, in Uchida ryu the cut is made directly from hasso (of course this makes the kata more difficult and perhaps less aesthetically pleasing). Kim Taylor graciously supplied the SeiDoKai version which I also included as well as Kobayashi sensei's version. Rei is with the tanjo held in honte grip. 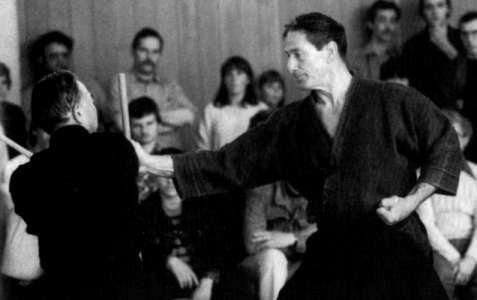 Strikes are administered with the mono-uchi of the tanjo, usually the stick protrudes about the width of a fist beyond the hand. In Zanshin at the end of each kata uchidachi corrects the distance first by moving backwards in kamae-otoku, shijo then corrects by stepping forward, lowering the tanjo. Seitei version: Uchidachi will attack with a shomen uchi cut from hasso. Shijo is walking towards uchidachi holding the tanjo in the right hand with the tip pointing down and forward (see drawing). At the right distance, while stepping forward with the left foot, shijo raises the tanjo (the tip moving up to the right). Shijo steps forward and to the right with the right foot and strikes the left wrist of uchidachi, the left hand is placed on the hip. This looks simple, but the timing is very difficult. Koryu version: Shijo advances with the stick in a natural walking fashion. At the right distance, while stepping forward with the left foot, shijo slides the hand down on the tanjo to the seitei gripping position, then raises the tanjo (the tip moving up to the right). Shijo steps forward and to the right with the right foot and strikes the left wrist of uchidachi, the left hand is placed on the hip. The strike is followed by a thrust to uchidachi's stomach. SDK: Hidari means a slip to the right front as you strike down on his left wrist. Right foot forward as you strike, make sure the tip is controlling his centreline as you strike down. Keep the tanjo to the right side out of range as you bring it up and down on kote. Seitei version: Uchidachi will attack with a shomen uchi cut from hasso. Shijo is walking towards uchidachi holding the tanjo as in the first kata. This time shijo evades to the left (step left with the left foot) and raises the tanjo (with the tip moving accross to the left). The strike is now to the right wrist (while stepping forward with the right foot). Koryu version: Shijo advances with the stick in a natural walking fashion. This time, while stepping forward with the right foot, shijo slides the hand down on the tanjo to the seitei gripping position, then strikes the wrist in a similar way as the seitei version, but without raising the stick that high. It's a much quicker strike coming from the wrist here. The strike is again followed by a thrust to uchidachi's stomach. SDK: on the step with the right foot forward he cuts shomen, you slide back (LeftRight) to the left rear as you bring your tanjo across your front and then slide back in (rightLeft) as you hit his right kote. Kobayashi: evade sideways to the left, not back. Seitei version: Shijo holds tanjo in gyakute (reverse) grip (tip pointing down backwards). Uchidachi attacks shomen uchi from hasso when shijo steps forward with the left foot to a very low stance (right knee hovers), strongly placing the end of the stick on the floor and sliding the hand to the middle. Shijo steps forward with the right foot (while remaining low), and blocks the attack with the tanjo horizontal, just behind uchidachi's elbows, with the right arm well extended, and punches upward with the left fist (kiai). The left knee is on the floor. Remain in contact with uchidachi's arms as he lowers the sword to his left, while turning the right knee to the right side somewhat (hand holding tanjo held close to the knee). Then face forward and stand up with the tanjo in a tsune-no-kamae like position. Koryu version: Shijo always advances with the stick in a natural walking fashion. The block is just behind the wrists instead of behind the elbows, and the atemi is a straight backfist instead of an upward punch. Push uchidachi's arms to the right. SDK: This is a backfist. The left and right steps are quick, slight delay in stepping with the left. Kobayashi: rather than lowering the body as much to grip the stick in the middle, the end of the stick is bounced on the floor. Seitei version: Shijo is walking towards uchidachi holding the tanjo as in the first kata. Uchidachi attacks shomen uchi, shijo deflects on the tsuka by stabbing to the face (uto), the tanjo is horizontal on forehead level, left foot forward, right hand holding the tanjo at the end, the left supporting the tanjo from the side. The arms are pushed down to the right and kept under control as shijo advances in suri-ashi with his left leg behind uchidachi's right. Uchidachi uses the tsuka to protect his groin, and turns away to his left to gain space for a horizontal strike, to attack shijo's knee. Shijo pulls back the stick so only a short bit extends from the left hand, moves forward and hits uchidachi on the side or ribs with this end (right arm remains extended down), thereby blocking his arms. Koryu version: In this version, shijo enters with his right side and pushes the sword down to his left (reverse from seitei version) which is much more destabilising to uchidachi (who has the right foot forward). From the walking position with the stick, the right hand is slid down on the stick, the left hand grasps the top (reverse from seitei, of course more difficult). The first movement is a strike to uchidachi's left hand, not just placing the stick against it. Another version is like the seitei one, but one enters directly to the right pushing down the sword instead of moving off the line to the left first with the deflecting move. This requires precise timing! SDK: Done on the fourth step, the third with the right foot is slightly to the right. Kuritsuke with left foot forward. Put your left hand over the tip of the tanjo to smack tachi in the ribs or your partner will develop bruises and be very angry at you. Then it's your turn. Seitei version: Uchidachi stands behind shijo, sword in the obi. Shijo starts forward with the left foot, uchidachi with the right. Uchidachi steps right, left, right, pushing shijo forward with the tsuka from the second step in order to draw, draws and strikes shomen. Shijo holds the stick with reverse grip and steps left, right, left and turn to the right, hitting uchidachi under the arms (fist strikes the armpit, tanjo across the chest) The left hand grabs the end of the stick, thumb to the left. The right hand slides over the arm to the wrist, and pressure is applied with the tanjo just above the elbow joint. Step in with left foot to unbalance uchidachi and push him to the ground. Koryu version: There is no contact with the tsuka against the back, you just feel uchidachi is drawing. Shift your grip on the tanjo and turn around. Instead of striking with the fist to the right armpit, you strike the groin with the tip of the tanjo (your right foot forward-towards uchidachi that is). The left foot is placed close to the right while the left hand grasps the top of the stick as in the seitei version, the right hand grasps his wrist while the tanjo is moved directly to the elbow in a striking movement, then apply pressure and step forward with the left foot (note that the tip of the tanjo remains in uchidachi's groin) and throw him. SDK: Plant the right foot then pivot off the line as you turn back toward tachi. Tachi thrusts you in the koshiita (tsuka ate) to get room to draw against you, that's when you pivot. Make sure tachi backs off the jo at the end, don't leave him close as you finish. Straighten the arms and put on the arm-bar before stepping in with the left foot or you'll collapse. Kobayashi: Shijo strikes across the chest, but does not hit the armpit with the fist, and did not step in with the left foot at the end for the throw. Seitei version: Uchidachi attacks shomen uchi, shijo shifts to the right, with the left knee on the floor, extends the right arm and stabs suigetsu. Left hand is on the hip. Koryu version: holding the stick in normal walking position at the start is the only difference. SDK: Keep the tanjo lined up with the right hip or you'll collapse. Good tenouchi. Kobayashi: the shoulders turn completely sideways for maximum range. Seitei version: Shijo shifts to the left, but places left knee on the floor as in the previous kata. All the rest is the same. SDK: This is the second way to move to the left side of the attack line, on the second step hesitate a bit, then as tachi starts to cut step to the side with the left foot, then quickly forward with the right as you thrust to tachi's right ribs (suigetsu is angled away from you and the tanjo slides off unless tachi has turned toward you as he cuts). Seitei version: Begins like the first kata, shijo stepping to the right, but hit uchidachi on the left side of the head with a large circular strike instead of the kote. SDK: Exactly as per #1 Kote migi, except the target is the right side of tachi's head rather than kote. Kobayashi: the jo is already left to trail back a bit while the left foot moves forward. Seitei version: Begins like the first kata, but turn a bit more so you strike down on the mune of his bokuto, then perform a horizontal strike to the right side of his head. Koryu version: evade to the right and strike sideways to the left side of uchidachi's head, with the palm of your hand facing up. Uchidachi leans back so the strike misses, and the stick continues to strike down his sword, then returns to hit him in the face as he straightens up. SDK: Not as you expect, on the third step slip right as per #1 and #9, but strike down on top of the bokuto in a roundish sweep so your tanjo moves to your left side, then return as per nuki-tsuke and strike to the head. (Yoko uchi) Tach must turn his head to the left to face you so as to protect his face, and the strike then would land on the right side of his head. Kobayashi: Note that for the first strike, shijo turns a full 90° hanmi facing left, then turns back towards the opponent for the second strike. Seitei version: shijo pauses with the tanjo at the side in normal grip. Uchidachi draws the bokuto and attacks shijo's right wrist. Shijo pulls back the left foot and raises the hand, tanjo pointing down. 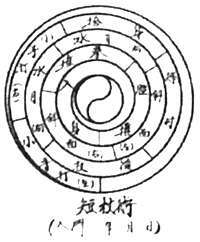 The tanjo is hit, rotates clockwise and strikes the sword to the left. The tanjo continues on an arc that ends at uchidachi's head. Koryu version: Shijo advances with the stick in a natural walking fashion. At the proper distance, shijo momentarily pauses to change the grip on the stick, which is when uchidachi attacks him. Most important difference however is that shijo withdraws the right (front) foot, then steps forward again with the right to strike. SDK: Another interpretation is to treat this like the block in Tora no Issoku, as tachi cuts for your right knee (you're walking) you circle the jo over and block, then circle t y the sword. Kobayashi: this is actually a block with the jo, similar to tora issoku in Hasegawa Eishin ryu. Seitei version: shijo, holding the stick in reverse grip, runs towards uchidachi with small quick steps, drops on the left knee, slightly to the left, and strikes with the jo to the shins as uchidachi strikes shomen uchi from hasso. At the impact the stick is pointing forward about 45�, shijo should not be too close, uchidachi must be able to deliver a proper cut to the neck from his position or the rest of the kata makes no sense. Uchidachi raises the sword to strike shijo's neck, shijo turns and stands up while moving the left foot to the left behind uchidachi, blocking uchidachi's right arm with the stick (the hand slightly above but close to the arm for proper control) and strikes uchidachi's side (floating ribs) with the left fist. Koryu version: shijo advances naturally, the rest is similar except that after the shin strike uchidachi must turn the hips towards shijo to strike, so shijo must enter more deeply to uchidachi's rear. SDK: Walking together as most previous. Tanjo in reverse grip, as tachi (draws??? ?, cuts from hasso I think) slide to left side (same shift to left as #7 suigetsu migi) and smacks the tanjo into tachi's right shin/ankle. (Sune crushing). You're inside now so tachi pulls back to cut do, lift tanjo up and block above his elbow, your hand above his arm, and do a reverse punch to the ribs with the left fist. Kobayashi: Enter deeply during the shin strike, almost past uchidachi. Strike strongly to the shins. Seitei version: Shijo is standing with the stick held with the right hand resting over the shoulders. Uchidachi advances cautiously in hasso, when close enough lowers the sword and performs a tsuki. Shijo steps backward with the left foot to hanmi (the right foot follows a bit I think), pointing the tanjo straight up in the process, and striking the sword down and to his right. He then moves slightly to the left, then enters with the right foot, drops on the left knee and strikes uchidachi accross the chest from (shidachi's) right to left, as uchidachi raises his sword to jodan. Koryu version: Is almost the same except shijo walks forward. After striking down the sword shijo does not move to the left first but steps directly forward with his second strike. SDK: This starts like kasa no shita with the tanjo under your hat. Tachi attacks like in Sakan, a big move down from hasso, back to left hip (left foot forward) then thrust with right foot moving forward. Jo turns his left side back (step back with the left foot to avoid the strike, then after the thrust is avoided, whip the tanjo down to strike aside the tachi. Tachi lets the blade travel to his left then up to jodan to cut. As he cuts jo slides to the left (RightLeft) drops to the left knee and strikes diagonally across tachi's chest (heart) one handed. No reason not to walk I suppose, but done from tanjo standing. Kobayashi: shijo advances also, stopping as tachi readies the thrust, and raises the jo to normal jodan while moving back into hanmi to evade the thrust.